Take a look through the items in this help centre; where you will find articles with how-tos and suggestions to help you resolve your problems. Detail the help that you need, with a brief description of any background information you may have: steps taken so far, etc. If you telephone us, we will need you to provide this ‘Support PIN’ and other details before we can make any changes to your account. Where can I find the Support PIN? 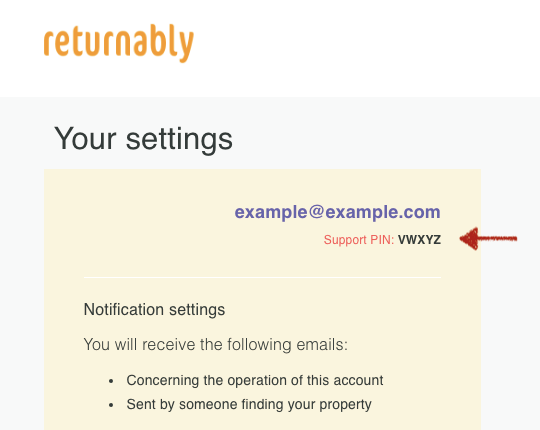 To get the support PIN go to Manage Tags - it can be found just below your email address displayed at the top of the settings page. It is to protect your account from being changed by an unauthorized person. So you must never share your PIN with anyone else other than when you send it to us. We do not think it is likely that your account will be attacked, but we do think it is better to be sure by taking this simple precaution.